This photo released by Military News Agency shows a general view at the site of a train derailment in Lian in northern Taiwan on Sunday, Oct. 21 2018. The Puyuma express train was carrying more than 300 passengers toward Taitung, a city on Taiwan's southeast coast, when it went off the tracks on Sunday afternoon. One of Taiwan's fastest passenger trains derailed Sunday on a curve along a popular weekend route, killing at least 18 people and injuring more than 170 others, authorities said. The Puyuma express was carrying more than 360 passengers from a suburb of Taipei in the north to Taitung, a city on Taiwan's southeast coast, when it went off the tracks shortly before 5 p.m., the government said in a statement. Some passengers were crushed to death, Ministry of National Defense spokesman Chen Chung-chi said. "Their train car turned over. They were crushed, so they died right away," Chen said. Earlier, the government put the death toll as high as 22, but the National Fire Agency, citing the Cabinet spokesman's office, later reduced that figure and blamed a miscalculation. Photos from the scene just south of the city of Luodong showed the train's cars in a zig-zag formation near the tracks. Five cars were turned on their sides. On a live feed provided by Taiwan's United Daily News, rescuers could be seen carrying what appeared to be a body wrapped in white plastic away from the site. "The underlying cause should be investigated to the maximum extent to avoid anything like this happening in the future," Lai said. "We will make the whole thing transparent." The Puyuma was launched in 2013 to handle the rugged topography of Taiwan's east coast. It is distinct from the high-speed rail that runs on the west coast. The Puyuma trains travel up to 150 kilometers (93 miles) per hour, faster than any other in Taiwan except for the high-speed rail. 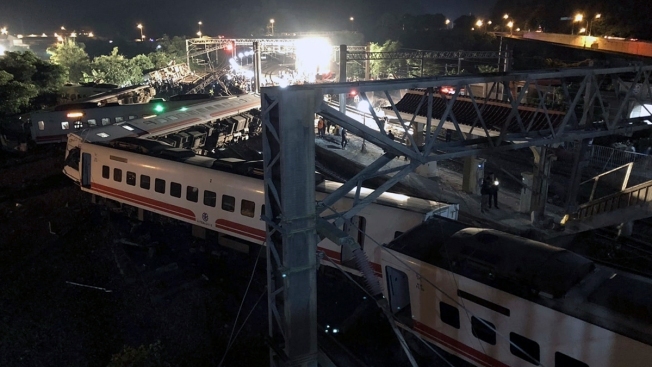 Sunday's derailment was at least the third deadly rail accident in Taiwan since 2003.